A tropical storm has formed in the eastern Pacific Ocean, off the coast of Mexico. The U.S. Hurricane Center in Miami said Thursday afternoon that tropical storm Lorena is located 394 kilometers west of Manzanillo, Mexico. It has maximum sustained winds of 64 km/h and is moving to the northwest at 19 km/h. Lorena is moving toward the northwest near 12 mph...19 km/h. This general motion is expected during the next couple of days. 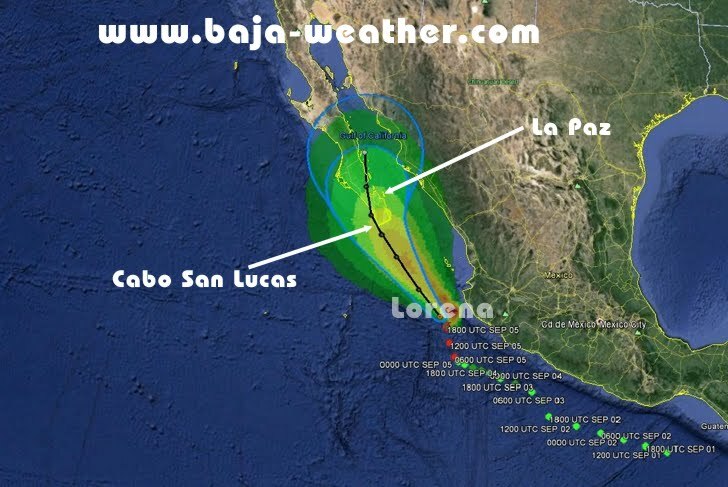 on the forecast track...Lorena will be nearing the southern portion of the Baja California peninsula early on Saturday. maximum sustained winds have increased to near 40 mph...65 km/h...with higher gusts. some increase in strength is possible over the next day or so. Tropical storm force winds extend outward up to 70 miles...110 km...northeast of the center.